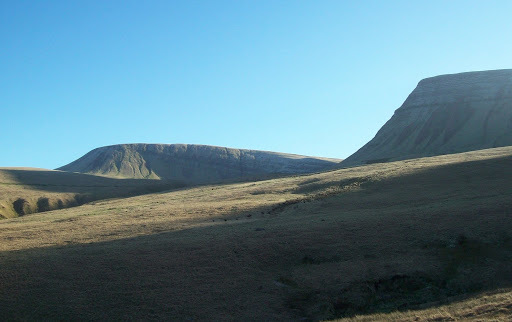 Another trip into the Western end of the Beacons – Black Mountain, and a walk along the Fans. 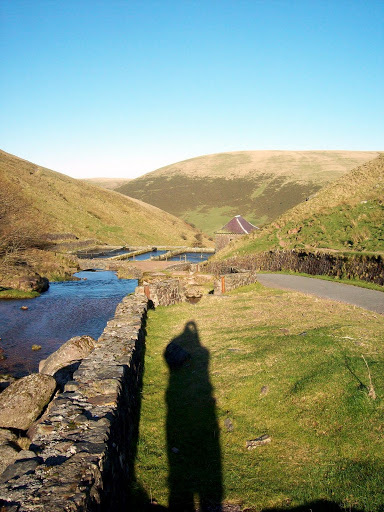 The weather was forecast to be cold, dry and sunny – and it was! Chris picked me up and then halfway there I realised my Buffalo was still in the airing cupboard after a clean and reproof. Thankfully I had a warm enough jacket with me which would pass muster and some other warm clothes if needed. 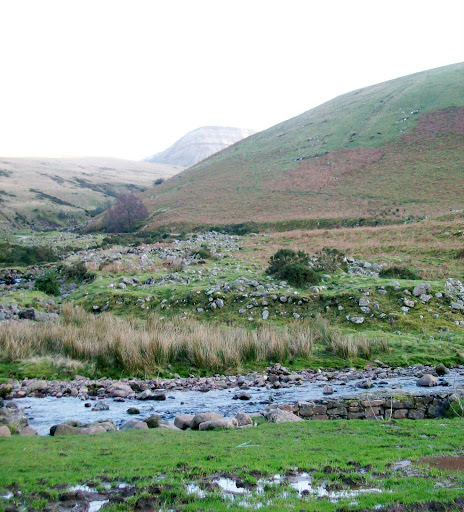 We drove to Llanddeusant and took the lane signposted to Lly y Fan and parked on the grass on the road to the hatchery. Surprisingly we were the only ones there. 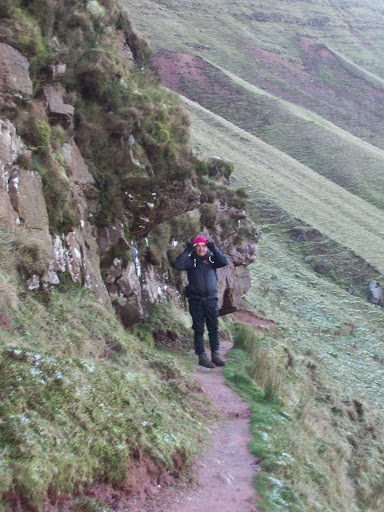 The walk up the path which is a rough road soon delivered views of the escarpment we had as the target. 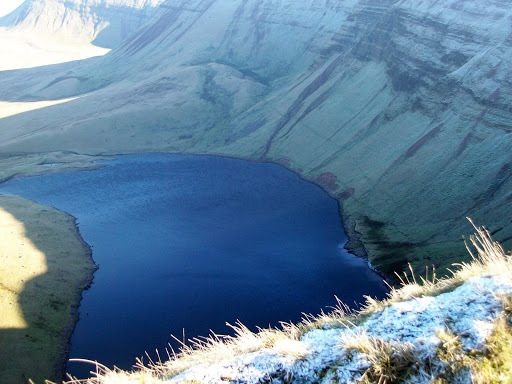 We left the track and cut uphill and soon had views of Llyn Y Fan Fach and the opportunity was taken for a coffee break. 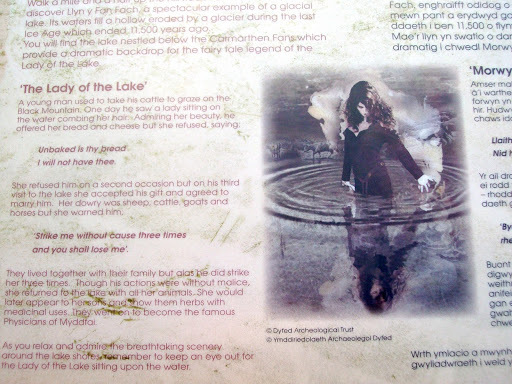 There is a legend attached to the lake and and a quick “Google” search will fill in the details. 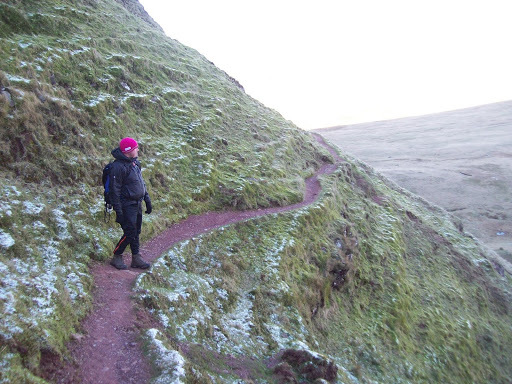 Suitably refreshed we started up the towards the ridge of Bannau Sir Gaer with views continuing to open up. Looking west we could see where our previous walk took us over to Foel Fraith area. We reached Picws Du and took the essential photo. Chris is wearing a fetching pink (or as he says Cerise) beanie hat. 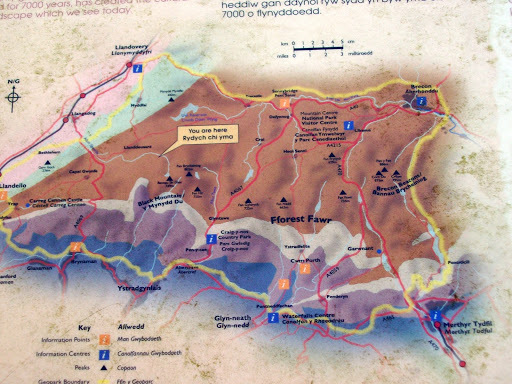 The route dropped down towards Bwlch Blaen Twrch – our path back. Instead of following the edge to Fan Foel we made a bee line for Fan Brycheiniog as there were rumbles from our stomachs. 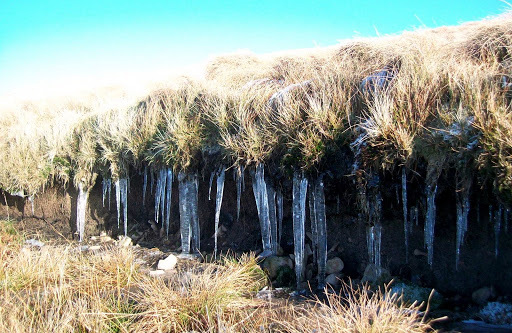 On the way up there was thick ice in places and some icicles hanging from a sheep scraping. There is a welcome stone shelter on the Fan where we were glad to break open the sandwiches. Just as we were finishing a couple arrived and to my surprise I knew the chap – Rob John from Pembroke who I usually see when canoeing and who arranges the annual Rowley Perkins Memorial canoe race. I had not seen Rob for some two years. 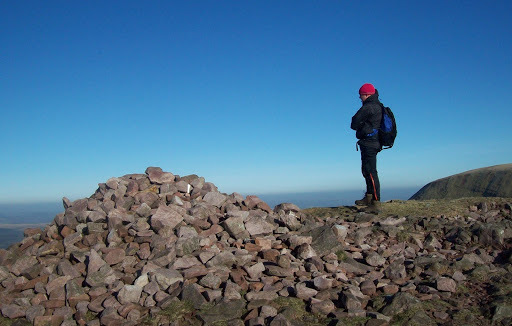 We parted company and started on our return journey this time heading to Fan Foel. We passed an odd large circle which had clearly been laid with a sheet to stop growth. Odd. Anyway on we went down to the bwlch and then continued down the steep zig zags which take you under Picws Du and towards a leat. We had seen this on our way up and could not work out which way the water would flow. However we found it flowing into the lake. We did some exploring to find the source of the water and found pipework which clearly goes underground. 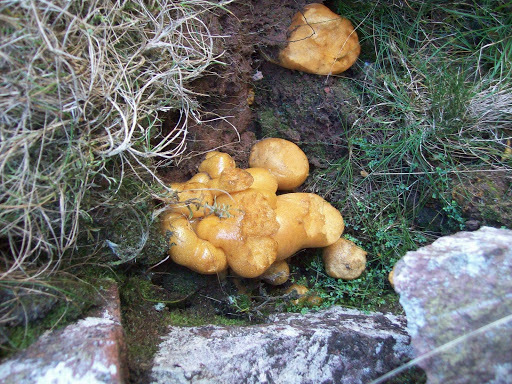 It was just by here in a crevice I saw what looked like yellow fungi, However some joker had cleverly placed some yellow foam which had been used in the pipework! From the leat we walked back to the car for a last cup of coffee. There were now several cars waiting their drivers. A cracking day with weather to match. Loads of walking in this area if you just want to wander.